It’s Friday! It’s also Near Miss Day, which commemorates March 23rd, 1989, when a large asteroid that could have left a crater the size of Washington, D.C. harmlessly passed by the Earth at a distance of 500,000 miles (810,000km). What a day to be alive, no? Nowadays, we have satellites telling us what Trump is up to and what Kim Jong-Un might be hatching in South Korea, but this sneaky, pesky asteroid (300-meter wide) was discovered only nine days after our close encounter. Afterward, scientists realized that had the asteroid hit Earth, the resulting collision would have released energy equal to 1000 atom bombs! The aftermath of the event would be presented in the form of a five to ten mile wide and mile deep crater and a devasting tidal wave at sea. NASA named this asteroid 4581 Asclepius after the Greek god of medicine, Asclepius, probably because they realized that they need to have some plan if they are to ever same themselves from a near-death experience. Medicines are to prevent or cure diseases, just as this asteroid will prevent the destruction of Earth. Too far-fetched? DART would be NASA’s first mission to demonstrate what’s known as the kinetic impactor technique — striking the asteroid to shift its orbit — to defend against a potential future asteroid impact. This approval step advances the project toward an historic test with a non-threatening small asteroid. 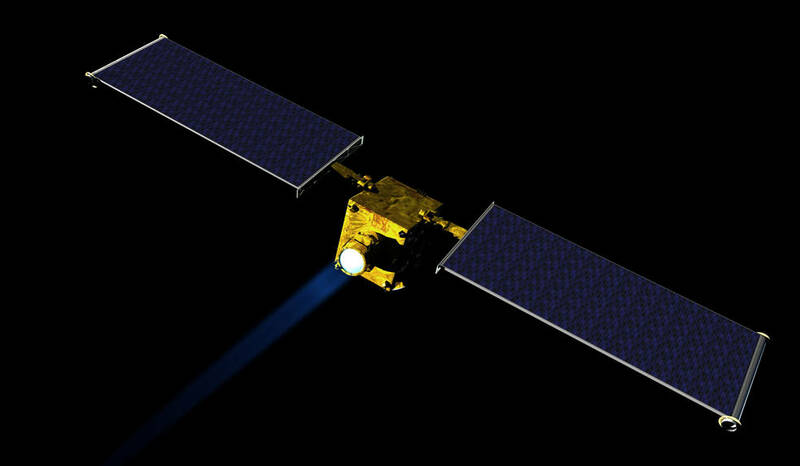 Artist concept of NASA’s Double Asteroid Redirection Test (DART) spacecraft. DART, which is moving to preliminary design phase, would be NASA’s first mission to demonstrate an asteroid deflection technique for planetary defense. The DART has a perfect target – Didymos B, an asteroid that will approach Earth in October 2022 and 2024. Didymos is in asteroid binary system with Didymos A. Both have similar structures, which is why they are called Didymos (twin in Greek). However, Didymos B is slightly smaller than Didymos A, a perfect target for DARt. Andy Cheng of The Johns Hopkins Applied Physics Laboratory in Laurel, Maryland, the DART investigation co-leader has stated that DART in protecting Earth from future impacts. DART is a critical step in demonstrating we can protect our planet from a future asteroid impact. Since we don’t know that much about their internal structure or composition, we need to perform this experiment on a real asteroid. With DART, we can show how to protect Earth from an asteroid strike with a kinetic impactor by knocking the hazardous object into a different flight path that would not threaten the planet. Moreover, NASA has established its Planetary Defense Coordination Office to assess and formulate capabilities to address these potential threats. This machine is responsible for finding, tracking and characterizing potentially hazardous asteroids and comets coming near Earth, issuing warnings about possible impacts, and assisting plans and coordination of U.S. government response to an actual impact threat. This system is really great because there are more of these asteroids than many people think – researchers detect about 1,000 new objects each year; 10,000 extraterrestrial objects beelining for Earth could still be unaccounted for. However, there is one that is of particular interest – an asteroid named Bennu that has the potential of smacking into Earth in 2135. The odds of Bennu actually hitting us is about 1 in 2,700, and the asteroid is not big enough to send us the way of the dinosaurs, anyway. So, we’re safe… I think. I mean, at least, we have a defense mechanism, right?